I usually don’t recommend advanced learning resources, not because I don’t have any to recommend, but because it’s much harder to find good stuff for beginner and intermediate learners. Since 2006, the weekly Skeptoid podcast has been taking on all the most popular myths and revealing the true science, true history, and true lessons we can learn from each. Interesting content – It’s refreshing to hear sombre reasoning about various myths, some of which I wasn’t even aware of. Most episodes are well researched and make a decent effort to summarise research into various topics. This isn’t unheard of in English, but I don’t know any other resource like this in Chinese (if you do, please let me know!). Audio and text in both English and Chinese – Since this is based on the English original, you can get the content in whatever format and language you want. Being able to read the Chinese article and hear it at the same time is very useful. It’s also useful to be able to check the English text for details or nuances. The Chinese translation is idiomatic and well worth studying. The audio is probably a little bit too fast for some students, but it’s still well produced and clearly enunciated. Just the right length – Each episode is roughly 8-12 minutes. Since this is packed with content, it will keep you occupied a lot longer. I think this length is just about right; it makes it possible to get into the subject and the flow of the episode, but is still short enough to squeeze into a busy schedule. 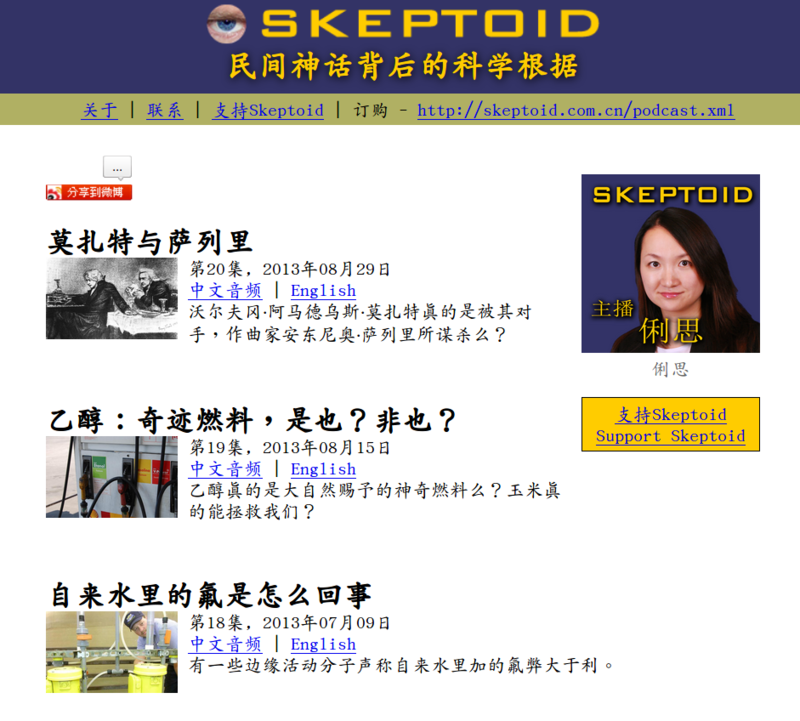 When I found the Chinese version of Skeptoid years ago, I was really bored with podcast episodes that were too short. It’s free – Just like the original Skeptoid, the Chinese version is offered for free. You are encouraged to support it, but that’s all. You can download all the episodes as mp3 files and browse the text versions online. In case you missed the link above, just click here to browse all the episodes. Okay, let’s say that I have convinced you and that you would like to have a go. Of course, you could just take a random episode and get started, but let’s say you don’t feel that confident and want more structure. Choose an episode you think sounds interesting. If you have no clue, I suggest this one about Stradivarius. This is a good example of what Skeptoid is about and is also quite interesting. Put the episode on your phone, mp3-player or whatever you fancy, then listen to it until listening again does not add to your comprehension of the episode. Consider using some scaffolding if you need to, but don’t underestimate the power of listening again. Note that it might take you dozens of iterations before you get stuck. Don’t force it, just listen and try to understand as much as possible. Now check the written article and look up anything you missed. If you’re really serious, you could try to write a transcript of the article before you check the written version, then compare your version with the original. This is very time-consuming, but I’ve done it many times and find it very worthwhile. Read the English article to clear out anything you might have missed. You can look at it earlier too if you think this is too hard. Knowing roughly what it’s about makes it much easier to understand, so this is a form of scaffolding. Don’t do this unless necessary, of course. If you want to turn this into output (speaking or writing), just write a summary or talk about the topic with a friend. Start by retelling the main points in the episode and then add your own thoughts and encourage your friend to comment as well. There’s probably room for a lot of discussion here, depending a little bit on the episode. Put it in your review folder on your phone or mp3-player and listen to it again whenever you don’t feel like listening to something new. You will find that you have a completely new understanding of the episode when you listen to it again! This of course includes all the vocabulary, sentence patterns and grammar contained in the episode. The only bad thing with Skeptoid Chinese is that there are no new episodes being produced and there haven’t been for some time. There are only a total of roughly twenty episodes, so when you’re done with those, you’re done with Skeptoid Chinese. I have e-mailed the host 俐思 a few times to see what’s going on, but have never received a reply. So, what advanced listening or reading material do you recommend? Do you have something as awesome as, or perhaps even more awesome, than Skeptoid Chinese? Please share in the comments! You’ve talked in the past about passive listening. Do you think it’s appropriate for an intermediate learner to use this type of advanced content as a passive listening option or will it just be too overwhelming? Thanks for all your work.